Journalists have designated the twenty-first century the Age of Genetics. Almost every day, the media carry at least one story about breakthroughs in this fast-growing field. Unlike other science news that is often buried on the back pages, genetics competes with politics and economics for front-page attention. For example, during one thirty-day period toward the end of 2001, the New York Times carried twenty-eight major news stories and commentary pieces on advances in genetics and related areas of study. In its assessment of the most significant events in science in 2001, the magazine Science News found that genetics ranked first, playing a key role in forty-eight advances. Astronomy was a distant second with only twenty-six. Statistics from the National Science Foundation reveal that genetics-based research receives more funding, both from government and private investors, than any other branch of science. The field also attracts more college graduate students than any other except computer science and information technology. Why all the interest? Genetics promises to bring about dramatic changes in almost every area of life: the cure and prevention of disease, the extension of the human life span, the modification of food crops to feed the world's hungry, improved intelligence quotients, more rigorous law enforcement, laboratory-grown replacement organs and other body parts, even the designing of babies to specifications determined by parents, and the cloning of genetically identical copies of individuals. Many of these changes are obviously welcome. However, many are controversial, challenging deeply held religious convictions and moral principles about how far humans should intervene in processes that, until now, have been deemed the exclusive sphere of God or nature. 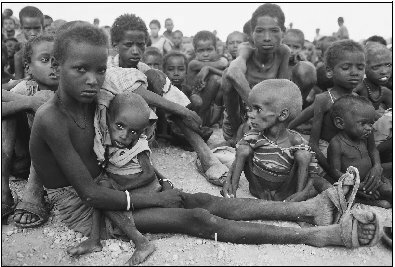 Hungry children wait for aid in famine-ravaged Africa. Starving people worldwide could be helped by the genetic modification of crops to make food more plentiful and more nutritious. Genetics is a relatively new science. It rests on two lines of research. The first is the discovery, made in the mid–nineteenth century, of how traits or characteristics (eye color or the susceptibility to a certain disease, for example) are passed from one generation of an organism to another. The second is twentieth-century biochemistry, which made great strides in explaining how cells function to create larger physical structures, like organs, limbs, and even entire individuals. About fifty years ago, these two separate sciences came together to produce modern genetics. But if the science of genetics is a recent development, the curiosity that inspired it dates back to the beginning of civilization, when the economic basis of human existence shifted from hunting and gathering to agriculture. Primitive farmers noticed that when two varieties of the same plant were grown close to each other, a third type—exhibiting some of the characteristics of the first two—often took root. Farmers who raised animals realized that breeding two hardy specimens together could sometimes result in offspring that were bigger and stronger than either of their parents. Early humans also knew that some traits tended to run in families. Tall parents often had children who grew up to be tall. Other observable traits also suggested a link between parent and child: basic body type, eye and hair color, even mental and emotional qualities like aggressiveness and passivity. From time to time, traits were observed to skip generations. Children might resemble their grandparents rather than their parents, for example. Interestingly, most theories that attempted to explain this wealth of observational information were drastically inaccurate. In hindsight, some of these ideas appear not merely wrong, but bizarre. Based on secondhand reports, the ancient Greek philosopher Aristotle concluded that if a camel mated with a leopard, the female would give birth to a giraffe. We now know that this is impossible (species are differentiated from one another by their inability to breed successfully), but to Aristotle and other early thinkers, it was logical to reason that traits from each parent animal would combine to produce uniquely different offspring. Another theory, which had its supporters until well into the nineteenth century, held that parental traits were blended in children. This notion implies, among other things, that all the children of a tall father and short mother would be of medium height. In fact, the evidence contradicts this assertion. The children of such parents can be tall, short, and intermediate in height. That the theory survived as long as it did in the face of contradictory evidence reflects the general state of confusion about the subject matter of genetics. The intellectual climate was also influenced by religion, which held that every creature, human and nonhuman, was formed by God. This devoutly held belief gave rise to competing theories, which also had adherents well into the nineteenth century. The first of these held that every child existed in miniature form in his or her father's sperm. The second differed only in asserting that the location of the tiny, fully formed individual was the mother's egg. After the invention of the microscope around the year 1590, a number of scientists claimed to have seen these minuscule entities, called homunculi, through magnifying lenses. Such was the state of speculation about genetics in 1865, when an eastern European monk named Gregor Mendel published the results of a series of experiments he had conducted on garden peas. Mendel concluded that the traits he observed in his pea plants—height, color, pod shape, and several others—were the result neither of a blend of parental characteristics nor of any preformed microscopic entity residing in the seeds he planted. Rather, Mendel said, these traits were caused by independent "factors"—one factor for each trait—passed down from generation to generation. Today, we call these factors genes. Although future experiments would prove Mendel correct, he offered no explanation for how these factors produced the traits he observed. Partly for that reason, and partly because he was an obscure researcher and not a leading scientist, his work was ignored until 1900, when the paper he had written thirty-five years earlier was rediscovered by Dutch plant expert Hugo de Vries. Along with two other botanists, de Vries re-created Mendel's experiments and in so doing gave birth to the modern science of genetics. 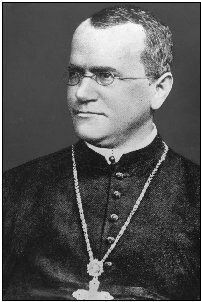 Gregor Mendel performed a series of experiments on garden peas in the mid–nineteenth century. His findings laid the foundation for the study of genetics. By then, chemists and biologists had come to a much more detailed understanding of the structure of cells, the building blocks of all living organisms, than existed in Mendel's day. In 1902, a link was established between chromosomes, large molecular structures in cells, and the inheritance of traits. For a time, chromosomes were thought to be the "factors" that Mendel had written about, but in 1944, American geneticist Oswald Avery realized that a complex molecule called deoxyribonucleic acid (DNA) played that role. Two years later, it was realized that DNA, which along with a few other chemical substances makes up the chromosomes, is divided into segments. These segments are the genes that provide the blueprint for an organism's specific characteristics. There were still a number of mysteries to be solved, however. In 1953, James Watson and Francis Crick discovered the structure of the DNA molecule. It is a spiral composed of two long strands, each of which is a mirror image of the other. This key insight enabled subsequent scientists to explain what Gregor Mendel could not—the chemical process by which genes, hidden deep in the body's cells, provide a pattern or recipe for thousands of different proteins. These proteins, in turn, ensure that each individual organism contains all the organs, limbs, and other physical characteristics that make it what it is. For example, they make a rose a rose rather than an oak tree; a horse a horse rather than a human being. The importance of Watson's and Crick's discovery cannot be overestimated. Together with Mendel's insight of eighty-eight years earlier—and the work of their contemporary, scientist Rosalind Franklin—it laid the groundwork for the diagnosis and treatment of genetic disease, the feats of genetic engineering, and all the other accomplishments that have made genetics the most intriguing and controversial science of the present age. It also made possible the monumental Human Genome Project, a vast international effort to pinpoint the precise location of every gene on every chromosome in the human body. This research was completed in the year 2003, and it will provide scientists with the tools they need to fully exploit the immense promise—and peril—of genetics.